Here at numbers 463 and 461 West 18th Street, just east of 10th Avenue, two brick commercial buildings were erected on a street that would have been lined with similar structures. The two-story stables was attractive despite its location and its straight-forward functionality. Bricks laid on end formed a dentil molding along the cornice and created decorative beading around the hayloft and the two arched windows that flanked it. Next door the small shop would have catered to the dockworkers and sailors while providing living space for the owner above. By 1938 when New York photographer Bernice Abbott captured the buildings, the stable had long ceased to house horses and was now a bar and restaurant – although still drawing its patrons from the still-active waterfront nearby. The little store at No. 461 was now a junk shop. The quaint little buildings escape demolition when the city erected massive public housing projects in the neighborhood, demolishing blocks of buildings. 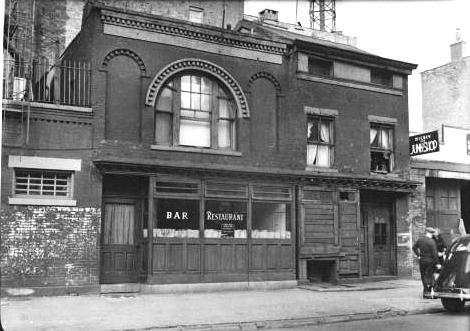 Today they appear much as they did to Bernice Abbott in 1938; the stables functioning as an extension of the adjoining restaurant on 10th Avenue and the little shop being privately leased as a studio.